As the name suggests, Content type defines type of the content such as item or document. In a real world scenario, A content type could refer to a invoice template or project plan document, etc. Content types provide a effective method of grouping relevant columns (metadata), document template, workflows and policies together and helps to standardize a template for reuse. Typically content types are created at the top level site as they are hierarchical in nature. In other words a content type created at root site gets inherited to all its subsites automatically. This saves lot of time as you need to create that content type only once and reuse it wherever required. 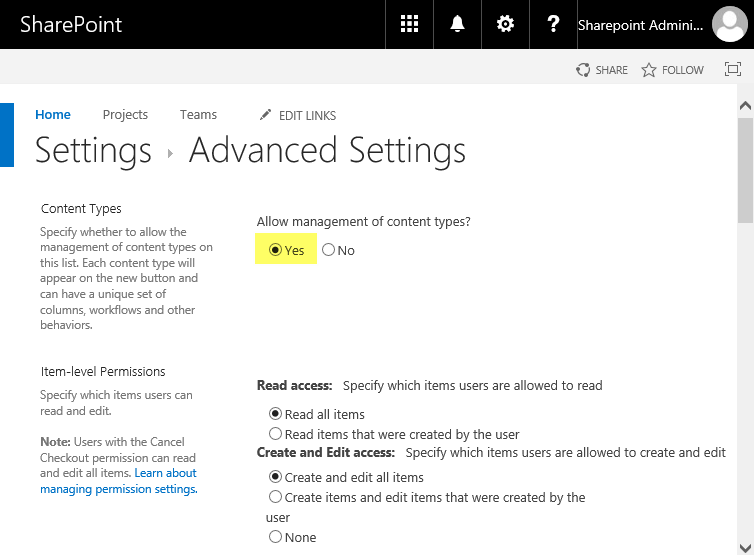 How to Enable Content Types in SharePoint Online? Set "Yes" for "Allow management of content types?" and hit OK button to save your changes. If you go back to list settings, you'll find a section "Content Types" with the particular list or library's default content type listed (E.g. Item for custom list!). You an add any existing content types to the list now!